FORTUNE -- Nissan Motor's new electric car, the Leaf, has a much more critical -- and less obvious -- mission than to enhance the cause of gasoline-free driving. As the first pure electric vehicle aimed at the mass market, Nissan has enlisted Leaf as a standard bearer for its campaign to clarify and strengthen its core brand. Nissan is the No. 3 Japanese automaker in the U.S. behind Toyota and Honda, with about 7.7 percent of the market. Its image has at the best of times appeared blurry and at the worst of times, confusing. A stronger Nissan brand could entice more customers to stay with it or its Infiniti luxury division when they trade cars. Formidable automotive brands like BMW usually measure their success in impressive profit margins. Though the automaker has a good reputation for quality and engineering, Nissan's marketing has sometimes been ineffective or counterproductive, as in 1983 when the company inexplicably dropped the popular Datsun name in the U.S., sacrificing awareness of the established brand. Toyota subsequently cultivated a reputation for quality and Honda a name for fuel-efficiency, outpacing Nissan as the Japanese brands of choice in part because American consumers were never quite sure what it signified. Nissan's inaugural Infiniti advertising campaign was ridiculed as charmingly obtuse, as it tried convey the essence of the Japanese aesthetic while nearly ignoring the cars. "Nissan has many of the same qualities as our Japanese competition, but no single one rises to the top," said David Reuter, a Nissan spokesman. "We believe zero-emission leadership, led by the Nissan Leaf, will be a clear differentiator for the Nissan brand." Nissan has scored some breakout model hits such as the Z series of sports coupes and the Murano crossover -- though they've never been tied together by an overarching theme, at least not in the company's advertising. One model in particular that has underachieved is Altima, Nissan's midsize entry, which many reviewers have praised but whose sales have been eclipsed by the Toyota Camry, Honda Accord and lately by the Hyundai Sonata. The Leaf has been featured in Nissan's "Innovation for All" campaign, created by TBWA/Chiat/Day, meant to position the brand as a forward-thinking name in the vanguard of the environmental movement. In one ad, a polar bear travels the globe in order to give a thankful embrace to a Leaf-owning man. In another, a father hears his wife is pregnant and responds by stretching his Nissan sports car -- via moviemaking magic -- into a Nissan Maxima sedan for his growing family. 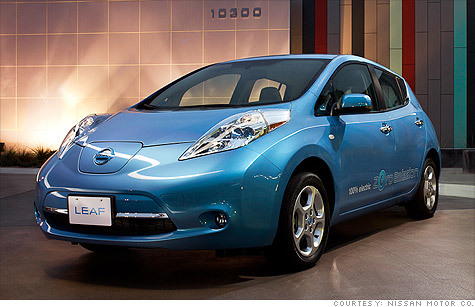 The battery-powered Leaf, which sells for $32,780 Leaf ($25,280 after the $7,500 federal tax credit) goes on sale in the U.S. in December. All 20,000 Leafs available for the 2011 model year were reserved online as of Sept. 23 by paying a refundable deposit of $99. The company hasn't said when it will begin taking reservations again. The Leaf, heavily subsidized by U.S. and foreign governments, will be manufactured first in Japan, then in the United Kingdom and finally in Tennessee -- assuming that the public embraces the vehicle and sales keep growing. But even if sales are disappointing, which could be the case if subsidies dry up and gasoline stays relatively cheap in the U.S., Nissan can still accomplish a great deal. Consumers of an environmental bent, of which there are plenty, are sure at least to consider the automaker. And if they don't buy Leaf, Nissan is hoping they find green innovation, or the appearance thereof, in some other Nissan model.